This is a replacement pump for the supra series alternating pressure mattress system. It can be used to replace a damaged pump or to use as a backup for your 8" alternating pressure mattress system. 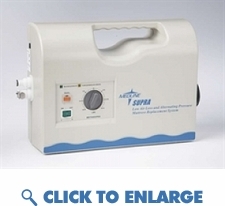 This advanced alternating pump is quiet and is designed for alternating pressure , and static float therapy.